The Many Applications of Laminated Glass! The glass is a versatile material which is used in building industry since ancient times. Traditionally it was only used in windows and doors so as to get natural sunlight during the daytime. As technology has advanced, glass is now significantly used façades, interior partitions, balustrades, railings for stairs and balconies, roofs, etc. The glass was traditionally known for its fragile character and was not used when more loads were to be supported. But with invent of laminated glass, use of glass in construction industry became prominent. Laminated glass is a processed glass which is a shatterproof glass and sticks to the frame upon any impact. A form of laminated glass is used to make a bulletproof glass. Here we have given brief information on laminated glass, its properties, and applications, which homeowners should know before buying glass for their house. Also Read: 5 Different Types of Float Glass That are Widely Used in Your Home! Laminated glass is made by sandwiching a layer of polyvinyl butyl (PVB) between two or more panes of glass. The PVB sheet bonds with both the layers of the glass and keep it intact even upon impact. The bond between PVB sheet and glass is a chemical bond and thus it does not delaminate easily. The glasses used in a laminated glass may be float glass or tinted glass. The layers of glass and PVB sheet can be increased according to the requirement to increase its strength. Laminated glass is resistant towards impact and penetration. Even upon impact, it will hold the glass fragments together, thus lowering the risk of injuries due to a glass. Due to interlayer in between the glass panes, the whole glass assembly cannot be damaged from one side. In case of theft or burglary, if the glass is cut from one side, then also the glass on other side is still intact so, the theft can be prevented. It can also withstand stresses due to change in temperature and pressure. It can resists impact with metals, stones, and even some small explosions, thus it used as security glass in urban areas. The interlayer also provides sound insulation properties to the glass. The interlayer damps the sound coming from a side and thus laminated glass is very much common where sound insulation is important, such as airports, recording studios, etc. Laminated glass also blocks most of the UV radiation and thus protects furniture from harmful UV rays. It has high durability and will remain intact during the entire life of the building. Laminated glass has moderate resistance to fire, as compared to normal glass. It will not disintegrate immediately but will take time to get shattered, thus the people can safely evacuate in case of fire emergencies. 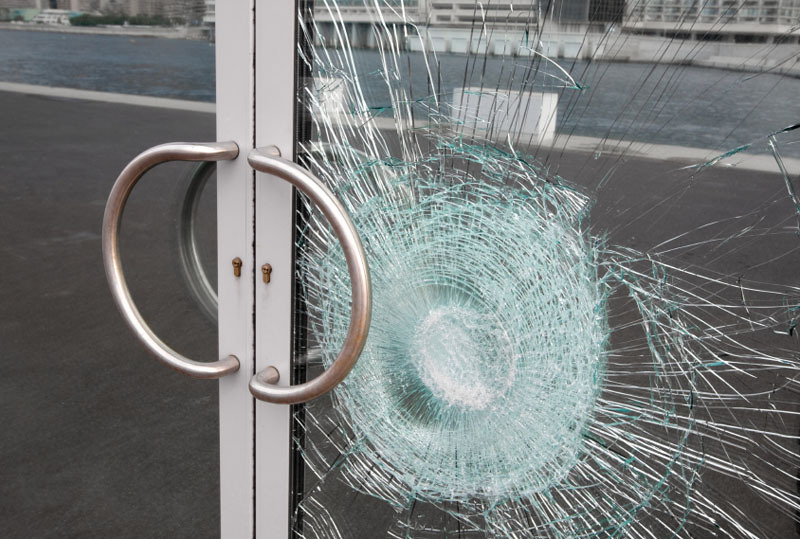 In case of earthquakes, float glass breaks and shatters while laminated glass remains in frames and thus provides safe route outside the building for escape. Laminated glass can even resist high winds such as in hurricanes and tornados, thus less damage occurs in emergencies due to natural disasters. Also Read: High Performance Glass: Know Types and Applications! Laminated glass is commonly used in windshields of automobiles. Due to their sound insulation properties, they are also used at airport terminals, recording studios, acoustic glazing, hotels, data – processing centers, aircraft, etc. In areas where hurricanes and tornadoes are common, laminated glass is used in glass facades, windows, doors, or in any exterior applications. It is also used in urban areas where burglary and criminal activities are predominant. It is commonly used as protection in structures like banks, money-exchange centers, jewelry shops, showrooms, museums, art galleries, aquariums, etc. Toughened glass is combined with laminated glass to make bulletproof glass. Several layers of glass with more thickness are used in bulletproof glass. It is used in places which have national and international importance. It is also used as structural glass such as glass railings, glass floors, skylight glazing, roofs, curtain walls, glass facades, etc. Patterned Glass: Architectural Glass With Textures! Extra Clear Glass: All You Need To Know!